Chris Lyall Tiling Solutions Ltd is a North Manchester based company offering a professional wall and floor tiling service to the commercial and domestic market. Managing Director Chris Lyall has over 29 years experience in all aspects of tiling and managing his large workforce ensuring high standards are consistently met. Chris Lyall Tiling Solutions offer competitive and high quality tiling services nationwide. 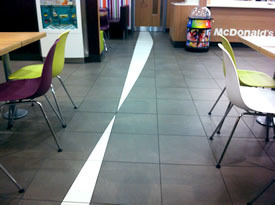 Some examples of our completed projects are providing wall and floor tiling services to McDonalds restaurants, both modular and refurbishment, costa coffee outlets new-build and refurbishment, car showrooms, hotels both new-build and refurbishment and within the health and care sector. We also have many years’ experience in providing tiling services to the house building sector with a vast range of specification from social housing to luxury bespoke projects and continue to offer exceptionally competitive and high quality services to the domestic market.